Constructed from high quality microfiber, the innovative new Cloudburst Rain Towel is the perfect golf towel. The practical, multi-purpose design provides the perfect size and shape. A water-resistant exterior keeps grips dry in wet conditions and the convenient zippered accessory pocket permits easy access to tees, balls and gloves when it pours. The Cloudburst is the only golf towel you'll ever need. The Cloudburst Rain Towel is an accessory every golfer should carry. 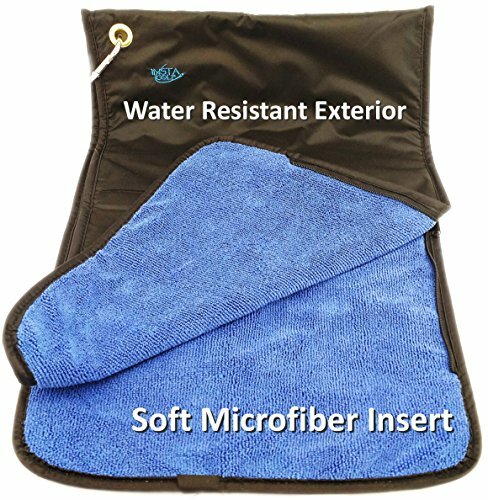 The multi-function design makes it a better towel. Take it to the greens, put your grips inside and you'll never have wet grips from dew on the grass. If you run into a rain shower, you'll always have a dry towel to shelter valuables and your glove. It is practical and convenient and a custom logo is easily added for corporate gifts and tournaments. If you have any questions about this product by Insta Golf, contact us by completing and submitting the form below. If you are looking for a specif part number, please include it with your message.